As a mechanic for over 20 years, Frank knows how frustrating it is to work with subpar tools. The job in front of you seems impossible and overwhelming. On the flip side, investing in the right tools makes your job easier, increases your productivity and gets the job done right. You feel better about the work you do. This is a lesson Frank focused on when teaching his students in Montréal years ago. 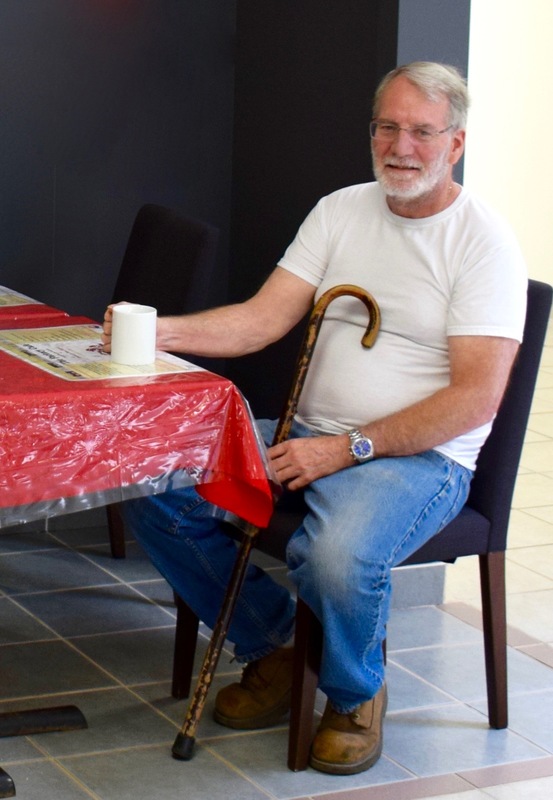 For a person like Frank who lives with Multiple Sclerosis, the importance of maintaining his independence with the aid of the right tools is not lost. For Frank, his cane and the Hospice Day Program at CHSLC are two of the right tools for getting the job done right! Just recently, Frank had a fall at home that left him on the floor for 24 hours. At the hospital he found out that he had the flu. As a person with MS, Frank knew that the flu symptoms are exaggerated due to the illness. However, the hospital staff were so focused on the MS disclosure that they didn’t take into consideration Frank’s mobility on a regular basis, when he doesn’t have the flu. They just couldn’t seem to get past the MS diagnosis. Frank felt like he wasn’t being listened to and felt like he was just another number in the health care system — he didn’t feel like an individual. As a result, the medical staff insisted that he use a walker instead of his usual cane that served him well for so long. The isolated flu incident also meant he lost his driver’s license for 6 months, even though he had never had an issue before. “Slowly losing my identity as a person.” That’s how Frank felt about his experience as a person with a disability within the health care system. We are completely aware that the health care system is only equipped to handle so much. That’s why we have programs like our Hospice Day Program at CHSLC. We’re working to bridge the gap between standard medical care and individual attention by giving ongoing support to our clients. As a participant in the Hospice Day Program, Frank has been to many social activities, eaten meals with friends, listened to a variety of guest speakers and more. He told us that he loves the funny antics of the group and appreciates the ability to catch up with like-minded people. The right tool for the job — CHSLC’s Hospice Day Program helps Frank feel better about himself and gives him the confidence to keep trying new things. During our interview he told us that he had shaved that morning. An act that may be taken for granted, but for someone with MS, leaning over the sink to look in the mirror or bend over to dip the razor under running water is very difficult. When Frank first came to CHSLC, he told us that he tried out a few support groups, but none of them seemed to be the right fit for him. We’re glad he gave us a try and especially thankful that he stayed. It’s always a pleasure to see him walking around the halls and see his smiling face!